“I wanted to have written a novel more than I want to write a novel,” said veteran singer/songwriter Steve Wynn. “I think I will someday. It’s a whole different discipline.” Given his knack for writing introspective moody songs in a journalistic fashion, it would only make sense that he would write a book. If he ever decides to do that, Wynn certainly would have enough material given his 20-plus years of experiences in music career. In fact, any survey of alternative music in the last two decades would be incomplete without mentioning Steve Wynn. He had established his name in modern rock as the founder of the Dream Syndicate, the Los Angeles band that was synonymous with the Paisley Underground movement of the early ’80s. The band that was heavily influenced by the Velvet Underground in time would inspire another generation of garage rockers in the ’90s. 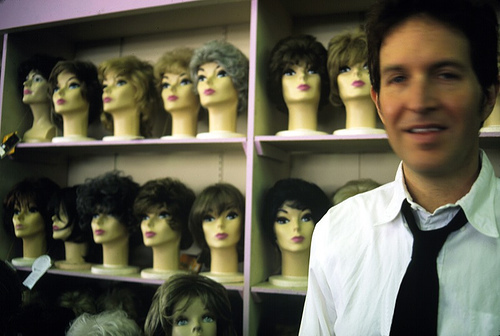 While the Dream Syndicate has been somewhat of a distant memory since its break up in 1990, Wynn continued to plug away, first with the super group Gutterball, and later as a solo artist. His 2001 double-record, Here Come the Miracles, reflected a music-making change of direction; rather than recording the album either in Los Angeles or in his adopted hometown of New York City, Wynn and his band recorded Here Come the Miracles in sunny hot Tucson, Arizona. The result was some hard and punchy songs, bone crunching guitar, and Wynn’s jaded vocals and wordplay. Described as a “party record” by the artist, the album garnered rave reviews not since the Syndicate’s classic debut The Days of Wine and Roses. Probably the most poignant song that firmly established the feel of Static Transmission is the meditative and somber “Maybe Tomorrow.” Wynn acknowledged the song was written with September 11, 2001 in mind, though it wasn’t about that day. “It’s more like the mood that I was feeling and people all around the world were feeling. It permeated what we did in this record. What felt right in the studio was probably a giant hangover from the event. I think the fact we got this deep, worried, soulful moodiness had a lot to do with what was in the air.” (Wynn wrote a moving account of the event that happened not far from his place entitled “72 Hours in New York City”-it can be found on his website stevewynn.net). If the enthusiasm of his music comes naturally on his records, it’s expands ten-fold when it comes to playing live. Having played in more shows in recent years than when he was in the Dream Syndicate, Wynn promises that the tour in support of Static Transmission will be no less different. Wynn’s sense of pushing those emotional buttons while simultaneously rocking with reckless abandon, as he did at SXSW, comes as no surprise given his reputation. When he first started out with the Dream Syndicate, Wynn was compared musically to the likes of Lou Reed, Bob Dylan, the Stooges, and Neil Young and Crazy Horse. The story of the Dream Syndicate-particularly the original lineup of Wynn, bassist Kendra Smith, guitarist Karl Precoda, and drummer Dennis Duck–needs no further reiteration except the fact they as influential on modern rock as R.E.M. and Nirvana was. Their arrival came at the height of the early ’80s Paisley scene in Los Angeles at its fertile and most exciting. Although they wore their influences on their sleeve, Wynn knew that his band was something more than just a copycat group. Unlike some solo musicians who seem dismissive of their erstwhile band’s past glories, Wynn was very agreeable about speaking of the Syndicate today, now over a decade after the band split. When Rhino Records re-released The Days of Wine of Roses with bonus tracks in 2001. (Wynn also produced the reissue and wrote the introduction to the liner notes). He explained why after 20 years that remarkable debut still holds up. “A lot of records that are good and sound good, five years after they’re made, are good because they are very natural and very believable,” he explained. “I think The Days of Wine and Roses happened in a very believable, honest, and spontaneous way, and that’s why it sounded good. Just the idea of I wouldn’t know which one to reform keeps me from doing it,” he explained. “I wouldn’t rule it out completely. It could happen someday but it would be a long time from now.” He joked that perhaps it might be possible in their early old age when they are senile enough to forget why they split in the first place.